***S E L E N A*** We will Always Remember You! To release a posthumous album is always risky. The most obvious challenge is that you don’t have the artist around to promote it — and in today’s Twitter-obsessed culture, shameless self-promo is everything (we’re looking at you, Justin Bieber). Secondly, there’s always the chance people have either a) moved on and just don’t care anymore, or b) are simply unfamiliar with the artist, and have thus settled — however unintentionally — for the hand-me-down version of what once reigned supreme, i.e. the Gaga to the Madonna; or, conversely, they care too much, and just don’t want that sacred memory messed with. In the case of the late Selena Quintanilla’s Enamorada de Ti, released on April 3, the hope is that it will not only overcome all those challenges, but it will surpass expectations. At least that’s what Sergio Lopes, Capitol Latin’s Senior VP and the mastermind behind the album, hopes. And if his track record with The Beatles’ 2006 album Love is any indication, he just might have his way (Enamorada de Ti is already No. 1 on iTunes Latinoin the U.S.). Seventeen years after her death, there’s still no second coming of the Queen of Tejano music anywhere in sight, so there is a void to fill after all. We phoned Lopes to find out the process behind the making of the album, the challenges faced by the label, and why a younger generation born years after Selena’s tragic passing in 1995 is still somehow emotionally connected to that girl from Corpus Christi with the big voice and the beautiful smile. How was the idea for the album born? I went to Corpus Christi with the intention of getting closer to the family, because the label has the rights to her recordings, but I wanted to be in sync with them. How do you record an album with someone who’s no longer alive, technically speaking? The master concept was, if you like Selena, then you’ll be able to listen to Selena in a way that you never did before. For this we built a concept album around her voice, not together with her voice. For example, when Selena was alive, there was a techno-cumbia trend, so there was a lot of drums, a lot of synthesizers, and bass competing with her voice. But after 17 years, we wanted the listener to feel her very, very close. For this, we applied several techniques. One, was to record the album live. That means we grabbed some of the best musicians in the world, like Sting’s, Santana’s, John Mayer’s, and Luis Miguel’s. We could have done all this with a computer but we decided to do it live. So once in the studio, we would play her voice [raw vocals extracted from the original recordings], and the musicians had to play with her, and they had to play until it was perfect. So that was really exciting. I’m sure you thought about the challenges this project would bring, so what were some of them and how did you overcome them? There are many things we can do. She has a very loyal fan base, so they promote among themselves. You can also look at her presence on the Internet [the label has built a whole website around the album, with videos, exclusive interviews with the family, social media components, and more]; she’s never had one like this before. It’s the first time Selena has a Facebook page – in two months we have reached almost 1 million friends. That instantly allows for the exchange between two generations of consumers. Secondly, the artists who are dueting with her [Cristian Castro, Don Omar, Selena Gomez, Samo and Juan Magan], they are promoting the album on their own websites, which is a very valuable marketing tool. For example, Selena Gomez last Saturday posted a message on her Twitter saying, ‘Hey guys, don’t forget, Enamorada de Ti comes out April 3 and it has my duet with Selena.’ She has 11 million followers. That extended to her Facebook, which has 29 million friends. So if you compare that kind of campaign with your regular marketing campaign, it’s much more valuable in quantity and quality. Can you break down the numbers involved in the making of this album? I understand it was recorded in different cities with many musicians. I call it the Titanic of Latin albums because it was recorded along 7 months, in 11 studios, using 46 different musicians, 6 studio producers, and 4 executive producers, me being one of them. This album is an act of love for the music industry, too; the number of engineers, assistants, and lawyers involved is unbelievable because every artist participating on the album, we had to sign a lot of contracts. It’s a lot of work, but the first thing was to protect her legacy. We tried to go the extra mile. When somebody comes to my office and I play the tracks, sometimes people cry in front of me. That’s the power of music. It’s a beautiful thing in the sense that they don’t even understand the technical aspect of the album, but they just feel the presence of the artist, they feel something good. That’s my personal reward. That’s the beautiful thing about music, it doesn’t depend on the physicality of the person. It can live on. Yeah, and it allowed us to fantasize a little bit: What would her music sound like today? What would she look like? The album cover, which was done by [Latin Grammy-nominated] Carlos Perez of Elastic People (Ricky Martin, Daddy Yankee) really took that into consideration. We tried really hard to portray her as she’d be today, which is a beautiful 40-year-old woman. Nothing was improvised here. Talk to me about some of the people featured on this album — why them? First of all, I didn’t want to do a full duets album, which would’ve been the easiest thing to do. It wasn’t because of lack of candidates. We wanted to be able to listen to her, so it ended up being like 40 percent duets, 60 percent Selena singing alone. For ‘Como La Flor,’ we decided to do a ranchera track and we thought Cristian Castro would be perfect for that. That might be my personal favorite on the album. He was very emotional, as was Samo [of Camila]. Both are great singers and when they had to be in the studio, listening to Selena and singing with her, it was an emotional moment. Samo was invited because Suzette, Selena’s sister, is a fan of Camila’s, and talked to him. That song [“Amor Prohibido”] came out very nice. What do you think is the appeal of Selena to young girls who didn’t grow up listening to her? The first time I went to Corpus Christi to meet with the family to talk about the album, I went to her museum and I spent 3, 4 hours there, just observing people. And I was very impressed by children who were crying in front of an outfit, in front of a picture. I was asking myself, ‘Where are these emotions coming from?’ They weren’t even alive when she passed away [in 1995]. I don’t know if it’s their families telling stories about Selena and it’s become a mythical thing. But that’s how the project was born. I said to myself, if I can capture that emotion, that’s the product. It goes back to this concept that music is beautiful because there’s emotion there. I cannot answer 100 percent because I’m still looking for the source of so much emotion. But I think Selena is above the music, too, because she was a humble person, she took care of people, she had a beautiful smile, and she transmits a lot of happiness. She never listened to her English tracks; she recorded them but never got the chance to listen to them all mixed and mastered. If she had 15, 20 more years [in the industry], imagine what she could’ve done. Will there ever be another Queen of Tejano Music? Who’s the closest thing to that today? She will never be replaced, because she was in a position and a moment in which Mexican Americans were reaffirming their identity. The Americans saw them as Mexicans and the Mexicans saw them as Americans; they were in a limbo. Abraham [Quintanilla, Selena’s dad] experienced that firsthand with his band, Los Dinos. Selena broke the social chains that were holding that part of the population back. So in a sense she was using the music to reaffirm their place to feel more important and valuable to society. Do you have an absolute favorite song by her? “No Me Queda Más,” that’s why it’s the first song on the album. In the first two seconds, she’s already made a statement: ‘I’m here.’ That song represents the whole concept of the album; everything is about her. We didn’t use any electronic tools to make this easier or cheaper, it’s just a team of great musicians. I think she’d be very proud of it. Any other plans to revive the Selena brand beyond this album? This is the first in a trilogy of albums. We’re going to have two Spanish albums, and one in English in the next two years. The next album will probably be the English one. We already have some incredible artists, I cannot say who, but they’re onboard. It’s going to be very high-profile. After the third album, we have 50 unreleased tracks she recorded before she even joined Capitol. We have enough material for 5, 6 years. That means the younger generation will have many chances to discover Selena. That’s the way we saw it with the family. Selena is alive through her music so if we can do something to maintain her legacy, why not? In the end the consumer will decide. One of the leading stars of Tejano music, Selena first began publicly performing at the age of 10, with a band which included both her siblings and her father. As Selena and Los Dinos, they would entertain patrons of her father's restaurant in Texas, eventually releasing their first album in 1983. By 1986, Selena's steadily-growing popularity earned her both Female Vocalist of the Year and Performer of the Yearhonors at the Tejano Music Awards. This led to the interest of EMI Latin, who signed her to a lucrative recording contract in 1989. Between 1990 and 1993, EMI released three Selena albums -- the second, Ven Conmigo, achieved gold status, and the third, Selena Live, earned her a Grammy award. During this time period, the singer eloped with her Los Dinos guitarist, Chris Perez, despite her father's opposition to the relationship. Also during these years, Selena opened Selena Etc., a pair of Texas fashion boutiques that further capatalized on her escalating popularity. As with so many popular singers, the inevitable venture into acting was made when Selena appeared in the 1994 romantic comedy Don Juan De Marco. In the first few months of 1995, work got underway for Selena's first major crossover album, to be released by the EMI-associated label SBK. Following an attendance-breaking concert at the Houston Astrodome in March, the singer discovered that the president of her fan club, Yolanda Saldivar, had been embezzling funds from her fashion boutiques; a confrontation was made with Saldivar at a hotel, who subsequently shot Selena to death with a handgun. The partially-completed album, Dreaming of You, was released in July and reached the number one position on the mainstream charts. 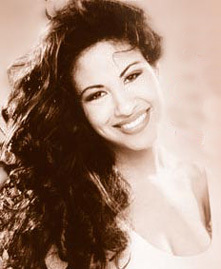 A film based on Selena's life, in which the singer was portrayed by singer/actress Jennifer Lopez, was released in 1997. Days Inn, 901 Navigation Blvd., Corpus Christi, TX. This article is about the singer. 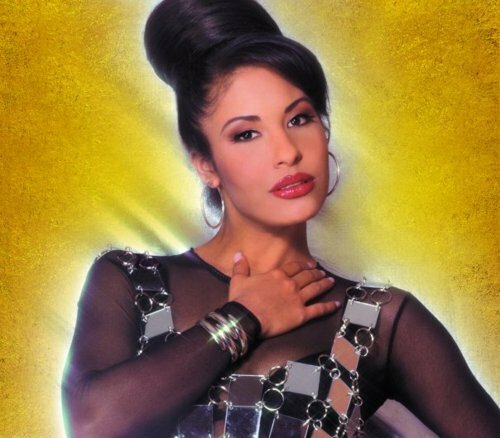 For the eponymous biographical film, see Selena (film). For the debut EMI Latin album, see Selena (album). For other uses, see Selena (disambiguation). Selena Quintanilla-Pérez (April 16, 1971 – March 31, 1995), known simply as Selena, was a Mexican American singer-songwriter. She was named the "top Latin artist of the '90s" and "Best selling Latin artist of the decade" by Billboard for her fourteen top-ten singles in the Top Latin Songs chart, including seven number-one hits. The singer had the most successful singles of 1994 and 1995, "Amor Prohibido" and "No Me Queda Más". She was called "The Queen of Tejano music" and the Mexican equivalent of Madonna. Selena released her first album, Selena y Los Dinos, at the age of twelve. She won Female Vocalist of the Year at the 1987 Tejano Music Awards and landed a recording contract with EMI a few years later. Her fame grew throughout the early 1990s, especially in Spanish-speaking countries. Selena Quintanilla's Official Facebook Page.